In 2012, the number of portable PA products is staggering. Active speaker and subwoofers are available from just about every professional audio company. The use of DSP processing and onboard power amplifiers inside these portable loudspeakers is such a treat! Setting up a great sounding, portable PA system is easy to do with all the great products on the market. Mackie Designs is one of those innovative audio gear manufacturers that has brought their new DLM Series of Speakers and Subwoofers that include a built-in digital mixer, DSP processing and onboard amplification. Mackie's new speaker design allows for a very compact and lightweight cabinet. Now you can transport your sound system in any reasonable sized vehicle from gig to gig. 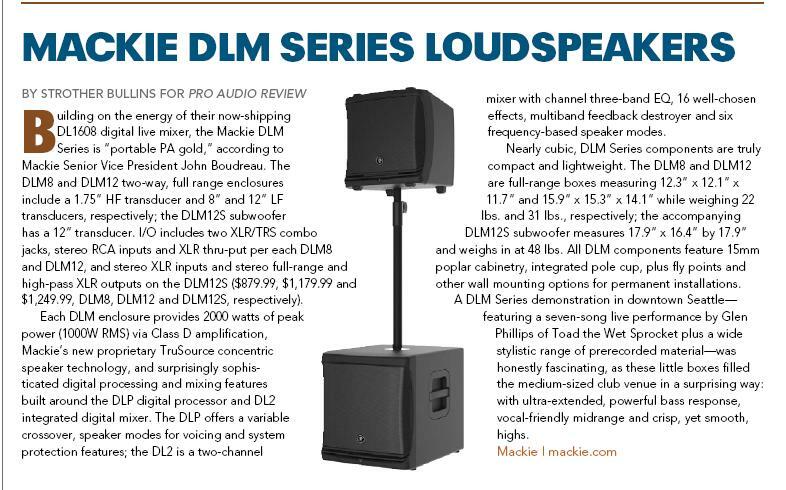 Recently, I read a review for the new Mackie DLM Series Loudspeakers. It was written by "Strothers Bullins" for Pro Audio Review magazine. Here is the article taken from the online edition of "Gear Guide 2013 - Portable PA For Live Performance". Please read first and then go to www.mackie.com for more details.